It might surprise you how people from two different cultures can have such different thinking and attitudes! 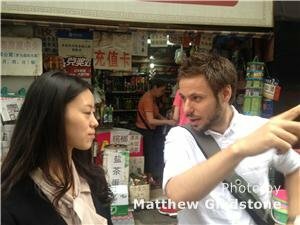 When visiting China (if coming from a Western country), it will help you greatly to think about the differences between Eastern and Western thinking, in order to understand Chinese culture, and to avoid so much culture shock. The differences between Eastern and Western thought can be clearly seen in modern society, despite globalization and unifying influences. The differences listed below are heavily stereotyped, generalized, and polarized. Not all Chinese (or Westerners) think this way, but these are observed tendencies. Chinese people like to internalize, i.e. keep their thoughts to themselves. Westerners like to externalize, i.e. share their thoughts. Private space for Chinese people is in their heads; for Westerners it&apos;s in their homes (or wherever they can&apos;t be seen or heard). People in the East tend to look at the whole picture and all the details, whereas people in the West concentrate on the main point or goal. 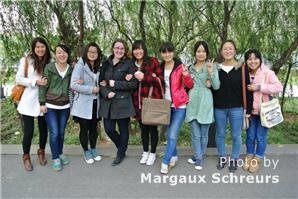 In China, many people are prepared to do things for the good of society. They feel a strong sense of unity. In the West, independence and freedom of choice are highly valued. Westerners feel a strong sense of individualism. They don&apos;t say "our" so much. "Eastern thought" can be represented by an &apos;O&apos; (for "Our" or a ring of people linking hands). 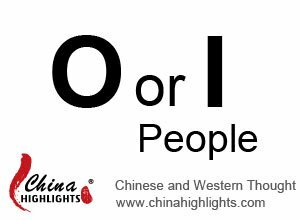 "Western thought" on the other hand can be represented by an &apos;I&apos; (for "Individual" or &apos;the first person singular&apos; or someone standing on their own). In China primary reaction to personal &apos;bad behavior&apos; is shame, but only if society judges the behavior as bad. In the West the main reaction is guilt, and this is personally driven by the individual, according to what he/she thinks is wrong. In the East, harmony and conformity to society&apos;s ways (including rituals and face-saving) is preferred as a way of preserving order, while in the West legalism and pursuit of "the truth" are preferred. Chinese have a strong system of respect. Much of this comes from the Confucian system of hierarchy. Harmony is considered more important than pointing out faults, so, when a fault must be mentioned, great care is taken to avoid giving offense. Westerners have a strong sense of what is right and wrong, and want to know what the "truth" of a situation is. While in the East respect is taken for granted, in the West respect is earned, and criticism is typically direct and unveiled. In China, be more generous with respect and tactful with criticism. In China people generally accept what authority figures say, and express agreement (even if they don&apos;t agree). In the West people question even the highest authority figures… all the time… and often quite openly. 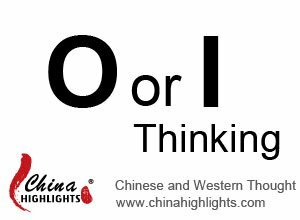 Keep on questioning after you arrive in China, but in many situations it may be advisable to keep your thoughts to yourself. For Chinese there is a recurring process of improvement (i.e. "things occur in cycles") with no definite end goal that can be reached. Westerners focus on getting to the end goal using the most efficient method (i.e. "a straight line"). Once again it may help to think of an &apos;O&apos; representing a repetitive, cyclic, holistic, consistent approach, and an &apos;I&apos; for direct, linear, focused innovative thinking, to show the sharp contrast between (stereotyped) Eastern and Western thought. In the East (China) there is an emphasis on consistency through formulas and repetition (e.g. the school system, exercises, politeness, rituals). In the West there is an emphasis on innovation and competition. Thus China has become "the factory of the world" and the West has become "the world&apos;s driving force for progress and innovation". It takes all sorts of thinking to make the world go round, and globalization is increasingly bringing both ends of the spectrum together. The forces of capitalism are now driving competition and innovation in China, which often goes against the grain, and consistency is also a goal in the West, but more difficult to achieve there. 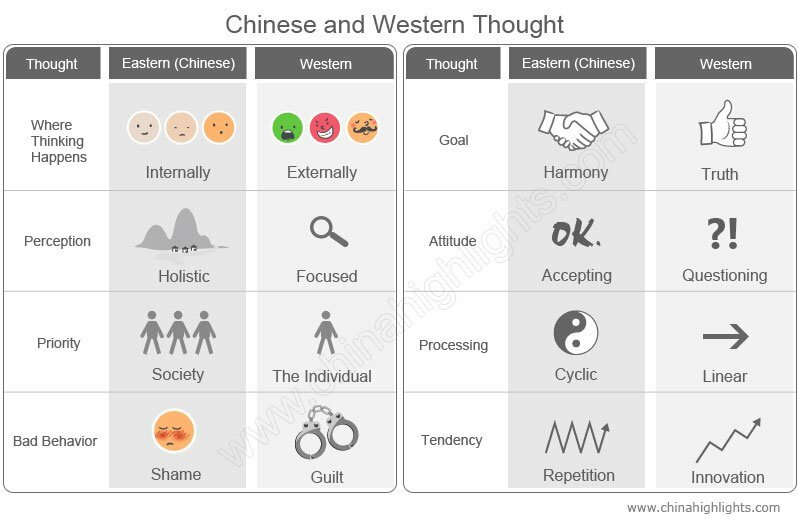 In the past Eastern (Chinese) and Western cultures have had very different formative influences, leading to major differences in thinking. Basically there are four ancient influences (geography, history, philosophy, and religion) and three modern influences (government, capitalism, and consumerism). Differences in Eastern (Chinese) and Western thinking may stem from something as simple as where people have lived. While China is surrounded by huge mountain ranges, deserts, and ocean, Western (European) nations have been surrounded by relatively smaller geographical obstacles and more navigable seas. Isolated, hostile geography may have contributed to insular thinking, and accessible geography may have promoted more individual and externalized thinking. 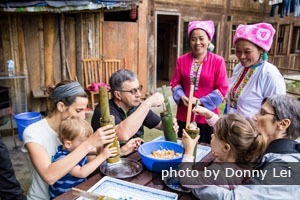 A generalized summary: While Westerners were exploring the world: fighting with, trading with, living with, and conquering other nations, while at the same time letting other nations across their borders; the Chinese were consumed with controlling things within their own borders, minding their own business, developing their own culture, and keeping others out. Basically Westerners seem always to have been individualistic externalists, whereas the Chinese seem always to have been society-favoring internalists. Actions have reinforced thought patterns, and established thought has led to more of the same actions, in a chicken-and-egg scenario lasting millennia. 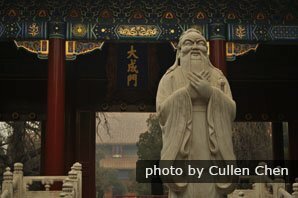 The founders of the contrasting philosophies of Confucianism and Rationalism all lived around 500 BC, but in quite different environments, as discussed above. therefore I am (a harmonious member of society)." Socrates and Plato, the founders of rationalism, taught individual understanding, through rational deductive thought, as the basis for comprehending the world. They also taught segregated thinking, in terms of the body and soul, individual and society, etc. Descartes, "the father of modern Western philosophy", was also a rationalist, famous for his statement "Cognito ergo sum" — "I think, therefore I am". therefore I am (a free and living individual soul)." 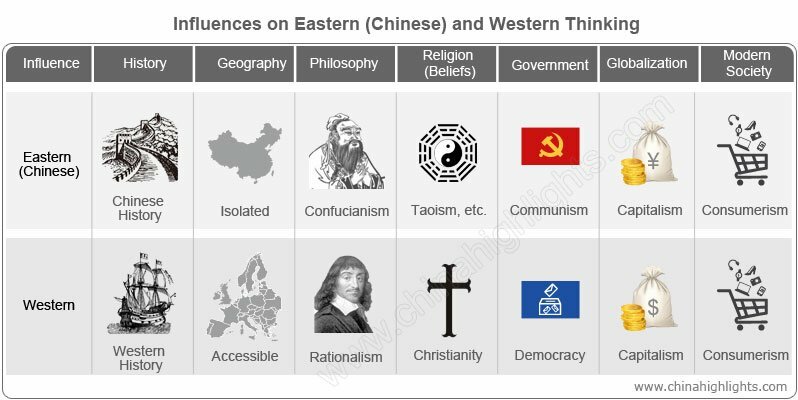 Although all the religions/beliefs covered below have Eastern roots, Christianity (particularly Protestantism) has developed according to and reinforced "Western thinking", whereas Taoism, Buddhism, and ancestor veneration dovetail with "Eastern thinking". Taoism developed in China from the fourth century BC with principles of harmony and cyclic repetitious processes. It promotes holistic and accepting thought and behavior, and claims no absolute truth. Buddhism arrived in China in the first century AD, with similar principles to Taoism. Since then Buddhist rites and principles of rebirth, harmony, and repetition, and have influenced Chinese thought and culture. There are not many practicing Taoists or Buddhists in China today, but there are very many ancestor venerators. Some people believe their departed ancestors need to be provided for by descendants. 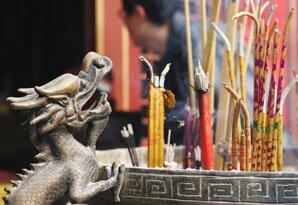 Others believe that ancestors not are even aware of what their descendants do for them, but the expression of filial piety is still important. In any case this ancestor veneration has again influenced thought in the direction of repetition, society, and shame. Christianity has been the prevalent worldview in the West (Europe) since about 300 AD. It can be said that generally the West has a Christian moral framework. A Christian worldview includes a belief in absolute truth: one God created us all and has standards that apply to all people, and guilt is experienced if God&apos;s standards are not met. Though Christianity teaches love for all people, unity, and an acceptance of God&apos;s word, its (Protestant) interpretation in the West tends to support individual, focused, linear progress ("innovation") towards a heavenly goal, and a questioning attitude in the pursuit of truth. Until recent centuries, Eastern and Western nations were all governed by a single ruler (and this tended to promote "Eastern thought"). However, when China departed from absolute monarchy it went the route of single-party republicanism and communism, whereas the West has adopted democracy. Communism fits the Eastern (Chinese) thought tenets outlined above, with its emphasis on society, common ownership and production, and egalitarian conformity, encouraging cyclic repetition, and holistic, accepting, internalized thought. While Communism is not practiced in China today, its influence lingers in education and strong one-party government control of commerce and the populace. Democracy, in its externalized focus on the individual, transparency (the truth will out), and questioning of government, can be seen to encourage "Western thought" even more than Communism and single-party government encourages "Eastern thought". While the modern influences of capitalism and consumerism are shared the world over, established thought processes in China and the West have produced differing responses and tensions in modern society. Different goals: Capitalism means that everyone is out to earn more, but in China wealth is (more) happily or customarily shared within the (extended) family and nation, whereas in the West wealth is (more) focused towards individual and private advancement. 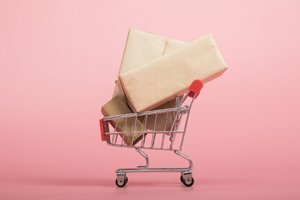 Different motives: Consumerism means that e.g. "everyone must have a car to feel good". However, in China people buy cars to fit in, whereas in the West people buy cars to stand out! Generally, Chinese motives are society-driven, and Western motives are individual-driven. Different conflicts: In China, the selfishness of consumerism conflicts with an inbuilt regard for family and society. In the West, the indulgence of consumerism goes against the moral and rational virtues of simplicity and prudence, humility and frugality. You may still be thinking that your own way of thinking (i.e. Western thinking) is best. 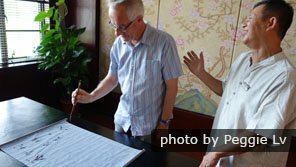 But, hopefully through this article, you can understand how and why Chinese thought has developed and can appreciate some of its benefits. 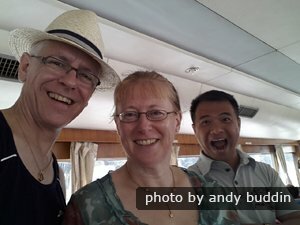 You can really have fun in China when your guide understands your way of thinking. THE GOLDEN TRIANGLE — Visit the must-see sights of Beijing, Xi’an, and Shanghai your way (8 days). 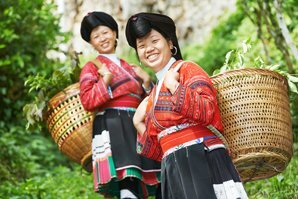 CLASSIC WONDERS — Appreciate the wonders of Beijing, Xi’an, Guilin, and Shanghai more deeply with us (11 days). 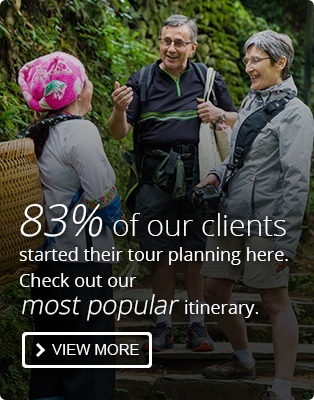 Traditionally, in China "the travel agency is right"; in the West "the customer is right". 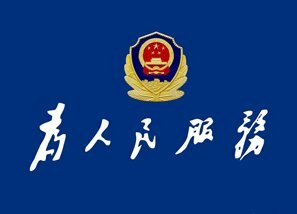 At China Highlights we&apos;ve adopted "Western thinking", and will do our best to accommodate your requirements. 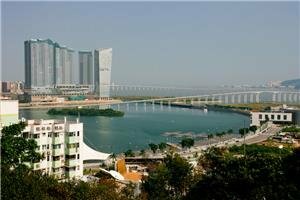 With us you can have a tour tailor-made from your requests.